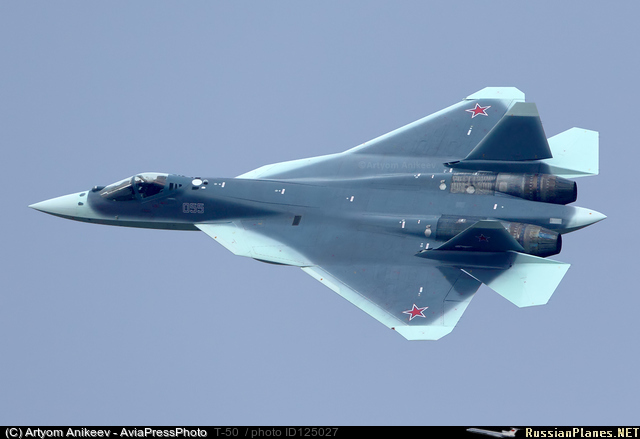 As already explained, Russia’s 5th generation stealth fighter plane T-50 (PAK FA – Perspektivny Aviatsionny Kompleks Frontovoy Aviatsii—Future Tactical Air System), has receintly received a new camouflage. A new image of the example 055 blue, taken on Nov. 22 by Artyom Anikeev gives a hint of what the paint scheme looks like as seen from the top (or when the aircraft is turning). Click on the image to open it at full resolution. As a consequence of the new color scheme (seemingly inspired by the White Tip Longimanus shark typical of the Red Sea) a T-50 seen from distance would appear as a rhomboidal shaped aircraft, smaller than the actual airplane.